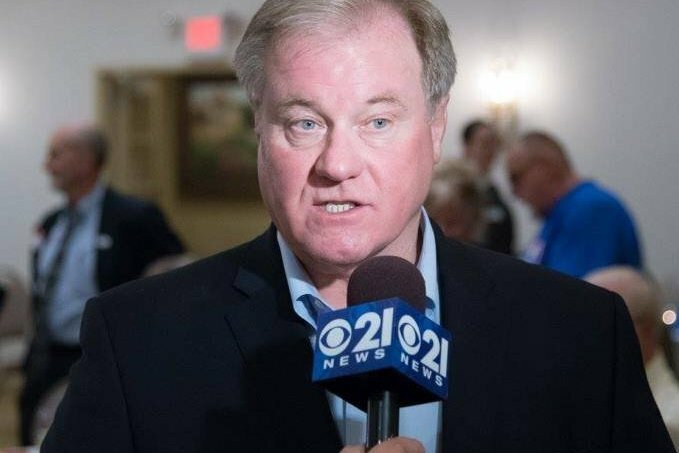 During a town hall meeting last Thursday in Zelienople, Pa., Republican nominee for Pennsylvania governor Scott Wagner expressed his views on what bathrooms transgender people should use. "Scott has a record of standing up for the LGBTQ community. What Scott has said repeatedly is that you should use the bathroom consistent with your gender. If someone transitions and goes through the appropriate steps consistent with the executive orders that have been put into place by GOP and Democratic governors regarding changing the gender on your drivers license, then Scott believes they should use the bathroom that matches their identity. What Scott doesn’t support is a declaration outside of the set policy that would allow people to circumvent privacy and protections." "It's real simple. If you're born w/ male plumbing, you use the mens room. If you're born w/ female plumbing, you use the ladies room. Period." “Let me, if I could — and I’ll be very brief, but let me talk about the bathroom issue. “I was asked, two years ago, if I would consider sponsoring an anti-discrimination bill. I went to see the senator that introduced the bill, and I asked him why was he introducing the bill. Give me some background. He said, ‘I have a friend who’s gay, or a relative who’s gay, and he’s concerned he could be fired from his job without any recourse or protection. “I took that bill and I took it to my law firm in Pennsylvania. I asked my employment law attorney, paid at my own expense. I asked for an opinion: Is this true, that if I have someone who’s gay and who works at my company, could I fire them if I find out they’re gay? The answer is yes. I do not discriminate in my companies, and I do not believe anyone in this room believes in discrimination. This town hall meeting occurred four days before a town hall meeting in Erie, Pa., when Wagner stumbled over a question about LGBTQ marriage. The midterm elections will be held Nov. 6.